Prep: Line two 15in x 21 in baking sheets with parchment paper. Preheat oven to 350F with the baking rack in the middle. Gather all of your ingredients and weigh them. Collect all the equipment needed. Combine 212 grams almond flour and 212 grams of powdered sugar and sift it twice into a large bowl. 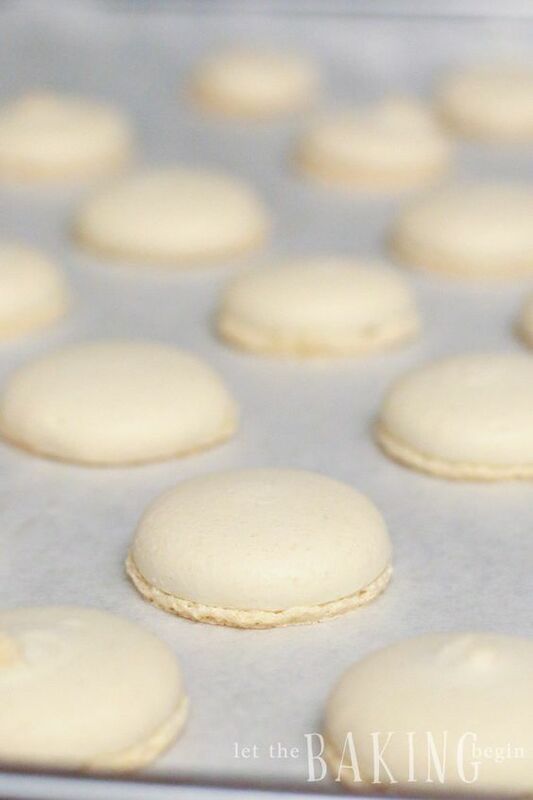 Basic Macarons - Italian Meringue Method - learn all the secrets to perfect macarons in step by step photo tutorial. Separate eggs and reserve 172 grams of egg whites. Place them in the microwave for about 40 seconds and heat in 5-7 second intervals, mixing in between each interval. Now take away about 90 grams of egg whites to a clean, grease-free bowl of a stand mixer. Add the remaining egg whites (82 g) to the almond flour and powdered sugar mixture that was sifted earlier. In a large bowl stir together the almond flour mixture and the 82 g of egg whites into a thick paste. In a small saucepan combine 236 grams of sugar and 158 grams of water. Place over medium heat. Stir the sugar until it dissolves, being careful not to splash over the sides of the pot. Bring to a boil, then reduce heat to medium-low and continue cooking without stirring until about 235F-240F. If there is sugar splatter on the sides of the pot, wash it down with a wet brush to prevent the formation of large sugar crystals. If the syrup crystallizes, discard the syrup and start over. When it does, whip the egg whites with 2 tablespoons of sugar just until foamy, being careful not to overwhip. Stop the mixer once the egg whites are whipped to the proper consistency, or run it on the lowest speed. If the egg whites do not look smooth and look lumpy or “curdled” instead, discard and prepare a fresh set of egg whites for this step (about 90 grams), remembering to heat the egg whites. Once the syrup reaches 248F, remove from heat and with the mixer running at the highest speed slowly pour the syrup between the bowl and the whisk. Continue whipping for about 8-10 minutes and until the bowl is cool to the touch. The meringue will be stiff, but a whisk dipped into the meringue and lifted will have a peak that slightly bends.